The economic vitality of a community is defined over decades, not years. While many ask “what have you done for me lately” the real story is in what was done 20 years ago that got us where we are and what are we doing now to define where we will be in 20 years. Kathy and I located in American Canyon in 1980. A neighbor knocked on our door and suggested I attend a meeting of the American Canyon Concerned Citizens. One thing led to another and I was elected Chairman of the American Canyon Concerned Citizens in 1983. The Concerned Citizens were organized to fight incorporation and preserve the rural character in American Canyon. They were successful in the early 1980's. My experience in public office began in 1985 when I was appointed to the Napa County Planning Commissioner at the age of 28. This was a pivotal time in defining our future. The Airport area had been zoned “general industrial” since 1955 and was mostly junk yards and open space. There were those arguing to return it to an open space zoning. However, I advocated that this was an excellent area for the industrial types of activities that support our wine industry that would otherwise be located on our agricultural lands. The plan also supported and protected the activities at the airport. We developed and passed the Airport Area Specific Plan which is still in effect today and defines the higher quality standards we expect for development in the business park and has resulted in many new industrial jobs. As a Planning Commissioner, we also rezoned the entire county for consistency with a general plan that has agriculture as its higher and best use. It meant reviewing every urban zoning designation outside of City limits and returning it to ag/watershed if it was not already developed into an urban use. The removal of this speculative urban zoning has reduced sprawl and kept our unique character. Preserving Napa's agriculture character has had the benefit of supporting the industry’s direct to consumer marketing and a unique and vital tourist experience. This in turn drives our success and job generation throughout the County. This County Planning Commission also began the discussion of "what is a winery" and "what justifies building it in our Ag Preserve"? We recommended and a subsequent commission concluded that processing 75% Napa grapes is what justified new wineries which continues to be a requirement for any new winery today. In 1990 I was elected to the Napa City Council. During that term we experienced a serious recession combined with a serious drought. The previous council had just completed the Linda Vista Area study and development of new housing was supposed to begin. We needed the housing and the construction jobs but the new water demands would be hard to justify. That is when we came up with the “toilet retrofit” program that allowed new development to offset its water use by reducing existing water use in older homes. This allowed development to move forward while reducing the communities water use. The program continues to this day and has kept Napa City water demands flat and has allowed our job growth to continue over the decades. Another challenge on the City Council was the redevelopment of rundown areas. The area now known as the Factory Outlets was worn down, mostly empty storefronts, and an eyesore. The application to upgrade the area had been approved but with the requirement to replace the local sewer lines and make other infrastructure improvements. The cost of these improvements kept the project from moving forward. I advocated that we allow the first three years of sales tax to be returned to the developer to pay for these infrastructure costs. After all, there was no sales tax to be collected if the project did not move forward. This worked and the project was quickly completed and now generates significant revenue to the City each year. Because of the recession, we did not have much to offer our employees during our labor discussions. However, I advocated for and we recognized the Martin Luther King Jr. holiday, which had not been recognized previously. This is a day that reminds us that the pursuit of “liberty and justice for all” is ongoing and not yet complete. It is good to remember those who were so eloquent and effective at addressing this issue. Such thing matter when defining who we are as a community. As a City Councilmember, I was also a big advocate for the flood control project. I traveled to Washington DC regularly with County representatives, including Supervisor Mel Varrelman, to press the the Federal Government to move the project forward. As a newly elected Supervisor in 1997, I was a swing vote to require a 2/3 vote for the sales tax measure dedicated to flood control as many wanted a simple majority vote which would not actually obligate the funds. The 2/3 measure passed and I believe the project succeeded despite serious recessions because the 2/3 measure protected these fund for flood control. This successful project has been a major catalyst for business growth in the City of Napa. I was elected to the Board of Supervisors in 1996. As a Supervisor, I continued to advocate for our airport area. The City of American Canyon formed in 1992, had grown and was now wanting to expand its borders. It was also arguing that it should not have to provide water to the Airport Area despite the fact that its water district was the designated provider for over a decade. Then Supervisor Dodd and I met with American Canyon City council representatives and hammered out an agreement that settled the growth and water issues. A new growth boundary was formed where none had existed before, water service was agreed to, and the Devlin Road extension was identified as a common priority. The result is an Airport Area that continues to attract new development and jobs. I helped negotiate a renewal agreement with Japan Airlines that was to extend their stay in Napa’s training center. A couple years later they had to fold their operation, but under terms that were favorable to the County. We are now working with another group which expects to re-open the pilot training center for multiple airline interests. In 1998 Big Tobacco entered into a Master Settlement Agreement (MSA) which would bring what would eventually be over $ 1 million per year to the County to use as it wished. Most Counties absorbed it into the general fund. At my urging we decided to set it aside and grant it to local health related non-profits each year to bring stability to these important partners in meeting community needs. We have granted $ 12 million to a long list of local non-profits in the last 15 years. See "Helping us help each other" in the pull downs above. There were a number of key ballot issues that I took leadership on as well. I continued to work to protect Ag and open space by leading the effort to stop Measure A “the takings initiative” that would have required the county to pay landowners for any limitation on their property. This would have unraveled our land use protections that are a big part to the reason for the agricultural and tourism success we see today. Supervisor Wagenknecht and I also led the charge on the ballot measures to create and fund our Parks and Open Space District. I also supported Measure P which strengthened the requirement to go to a vote of the people when land use is changed from ag watershed to an urban designation. 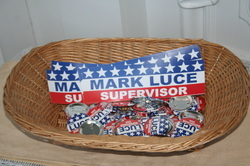 As a Supervisor, I also serve on many local and regional committees. At the local level, I served on the Napa Sanitation district and advocated for reclaiming water for use in the Coombsville area and the Carneros Area. This will allow for continued agricultural, recreational, and school activities while displacing well water use. This will preserve existing homes and jobs in these areas. Thanks the Supervisor Caldwell and others who helped organize the water users to make the district a reality, we now have reclaimed water being delivered to these areas. My participation on the Association of Bay Area Governments (ABAG) began in 1997 serving on the Hazardous Waste Committee. I soon became Chair and advocated for the development of the Green Business Program which tailors pollution prevention checklists to specific industries allowing them to identify ways to reduce their footprint and become a Green Business. It was a pilot program in Napa in 1997 but is now a statewide program with over 3000 Green Businesses in the Bay Area. This is a business friendly program that benefit both business and the environment. I joined the ABAG Executive Committee and was eventually elected by this body of elected representatives to be their President in 2012. This was a critical time as I oversaw the develop of the Bay Area’s Sustainable Community Strategy, also known as "Plan Bay Area" which now guides the intelligent development of the San Francisco Bay Area. This is a plan that is sensitive to local government and business while addressing the needs of a growing community. It targets housing growth near transit and large job centers while also recognizing priority conservation areas. For the first time, the Bay Area housing allocation to Napa was consistent with our local general plan. I am currently the "Immediate Past President" of ABAG which retains many important regional responsibilities. I was also nominated by the City Select Committee, made up of the Mayors of Napa County, and subsequently appointed by the Board of Supervisors to serve on the Metropolitan Transportation Commission. As an MTC Commissioner I was able to support a $6 million grant to extend the Vine Trail to Calistoga. We are also looking at merging MTC and ABAG into one regional agency. There are many other stories to tell of key actions that brought us where we are today. But it is also important to continue to look forward. This past year we asked ourselves if the land use policies we have today will bring us where we want to be in 25 years. Many topics we discussed and one key conclusion is that we need to require annual reports from each of our wineries to verify they are operating consistently with their permit. This will allow the 75% grape sourcing rule to have its effect on limiting growth to those wineries actually producing Napa fruit.